One of the most important pages on your law firm website is your “About Us” page. While your entire website should reflect what your firm does, the types of clients you represent, and your corporate beliefs as a whole, your individual profile allows you to begin to build a personal connection with a website visitor that other page types simply don’t allow. Your About Us page is your opportunity to speak to a prospective client about what makes you the right attorney for their specific legal needs. As marketers, we typically describe your About Us page as your opportunity to sell yourself to your client. However, most attorneys are not big fans of “selling”, and that is often part of why they entered their field of study. So let’s look at this from another perspective. Instead of thinking of it as a sales tool, consider your About Us page to be a letter from you to an unknown client. What do you most want them to know about you and your law firm? What makes you different and special? What can they expect from working with you? 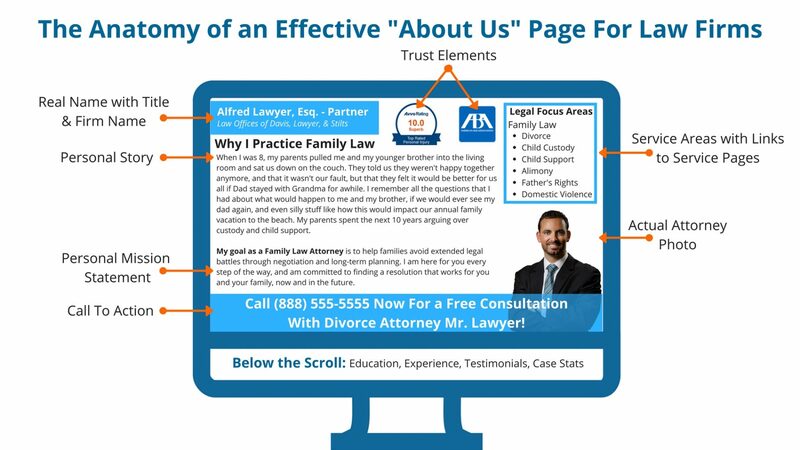 If a client is actively searching for legal representation, chances are they have already seen several About Us pages, most likely within the last 5-10 minutes, so differentiating your approach from the other attorneys in your local market can have a big impact on your ability to capture new clients over your competitors. There are many different styles and formats for About Us pages, from straight resume style pages to highly interactive, graphic pages. The right solution for an attorney falls somewhere in between these two extremes. Your page should be easy to read with definitive blocks of information, making it easy for visitors to find what they are looking for. This part is pretty basic but is neglected more often than you may think. Make sure to include your real, full name, your title, and the name of your firm. You may even wish to include your position within the firm. Trust Elements, such as badges and awards, help you to tell a visitor why they should trust you by showing your affiliation with other trusted groups or organizations. Trust elements are often perceived as an endorsement for you and your firm. Listing out your areas of focus in a recognizable block allows visitors to quickly identify if you can help them with their legal need. If they need assistance with estate planning, they may not realize that could be encompassed under “Family Law”. A detailed list helps them to understand your specific skills. Nothing starts to build a connection better than seeing someone face to face. Since it is impossible for you to shake hands with every person who visits your website, we default to the next best thing- your picture. Using a high-quality photo of yourself helps to reinforce the fact that you are a real, local attorney ready to help. The image that you choose can say a lot about who you are as an attorney. Hero Shots are so important that we have dedicated an entire blog post to the topic! This is the area where you can really set yourself apart from other attorneys. I challenge you to go look at the About Us page of your top local competitors. Chances are you will find a description of the education of the attorney, some awards they have received, and a general firm overview. While those elements are important, is that really what a prospective client wants to know? Probably not, at least not immediately. They are reading your About Us page because they want to know about you! Sounds pretty obvious, but can you tell me why any of the attorneys in your local market decided to become an attorney? Why they are passionate about their branch of law? What personal connection it holds for them? Most likely not. By discussing your personal journey to becoming a legal advocate, you not only set yourself apart from your competition, but evoke feelings and response from your website visitor. They get a better understanding for who you really are, your drive, and begin to connect with you on a personal level before they even speak with you for the first time. Someone who is looking for your services wants to work with an attorney who will passionately advocate for them, and telling them that you will is simply not enough. They have to come to that conclusion themselves, and it is up to you to guide them. This ties to your personal story and should serve as the conclusion. Now that you have described your personal journey to becoming an attorney, it’s time to bring it back full circle. Reinforce how your personal story has impacted the way you practice the law, whether it makes you more patient, helps you to understand their needs, or allows you to avoid undesired results. Now that they know all about you, make it easy for them to reach out by providing a call to action directly on your About Us page. Whether it is a link to your contact form or a statement including your phone number, it should be bold and stand out from the other elements on the page. Neglecting to add a call to action to your About Us page is like creating a treasure map and forgetting to mark the X! You can add traditional elements to your About Us page such as your education, experience, testimonials, case stats, and career path leading up to your current position, but these should be included lower on the page after your personal story and personal mission statement. These are secondary elements that reinforce your expertise, rather than primary elements used for building a client connection. If you choose to add testimonials to your About Us page, we recommend highlighting one or two really stellar reviews and relegating the rest to your testimonials page. If you have enough case statistics to share, consider making that a separate page as well. Need Help Crafting an Effective Legal About Us Page? If you need assistance creating an About Us page that is impactful, effective, and something more than just your resume, we can help. Contact Mark My Words Media at (877) 721-8491 for a Free Consultation!